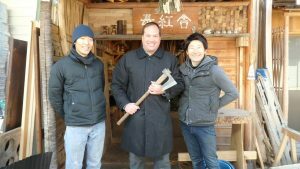 On February 12th Stuart from the United States participated in Experience Woodworking Tools! He was visiting Japan for work. And he sewed between work and took part in my experience. 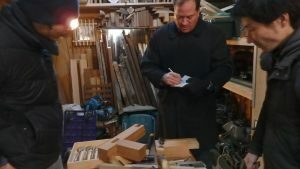 His hobby is woodworking, he says he is going to make his home garage the workshop next time. 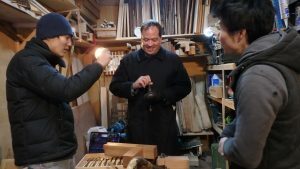 Everyday he enjoys his hobby woodwork using power tools, but since he wanted to enjoy woodworking using hand tools too, he studied the kind and usage of the hand tools carefully. 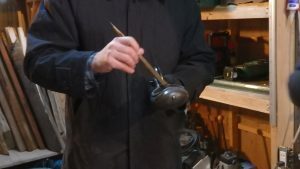 He seemed very happy to learn to mark with a charcoal ink using a pen of bamboo. 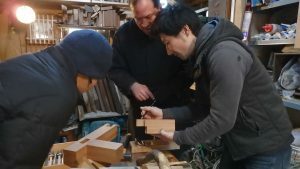 And he was seriously learning so that he noted the idea of ​​the size of the dovetail in his memo. It was very cold, but it worked very enthusiastically until the end. He also experienced Japanese planes, and he came to join a professional in a matter of hours. I appreciate each other’s wonderful experiences. 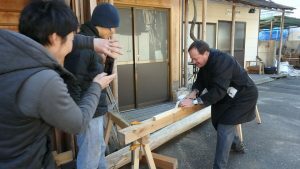 Your cooperation is necessary so that you can share woodwork with people all over the world!→Study Woodworking in Japan!